In India, there is a village whose lifeline is as long as a railway bridge. 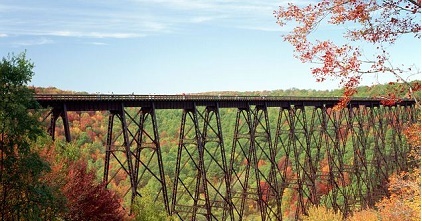 Existence of this rail bridge means 'life', if it doesn't exist it means 'no life', or even 'death' in some cases. It's been 68 years since the country has gained independence. There are talks of development and improvement of life quality of people all around India. All seems rosy. But all is not well. There is still a village in India name "Nakatpura", near Dhaulpur in Rajasthan, where railway bridge is the only thing you can use to get 'in' or 'out' of the place. Believe it, there is no other road or route to connect to other towns and cities. This might shock you, but it's true. Now, If a train comes running in while villagers are crossing the bridge, there is no other way for them to save their lives but to jump into the Chambal river and hope for the best. Among the people who cross the bridge are small school going children, ill people, and woman too. There are many trains which run on this route too, and unfortunately train timings (see latest train schedule and timetable here) are such that most trains cross the bridge during day time when people move most. The reason behind this situation can be seen in the population of this village. Only 400 people live here. This means it is not a major vote bank for political parties. Even during election times in India, when contesting candidates tend to find time to show their faces to most people in their constituency, in case of Nakatpura village they bother not to do it. It doesn't really effect their results, you see. Villagers, while talking to us, said to us that during last national election one MLA tended to come to village to address the locals. Like everyone else, he needed to cross the rail bridge to meet people. While he was crossing the bridge a superfast train came running in at full speed. The MLA somehow managed to get off the track running backwards. And that was the last attempt any politician made attempt to enter this 'railway bridge' dependent village. No one since has gathered courage to come to Nakatpura village. The lack of road is affecting the life of this village very badly. Pregnant woman, during emergency, opt to avoid to go to hospital across the bridge in fear of accident. This means that they take risk during delivery and births took place using traditional delivery methods. Like wise school going children, especially girl child, tend to dropout from schools early and as such remain devoid of higher education for their life's. It's high time government and ministry of railway identify such villages and do something to make their life safe and better.